A painting of a woman working in a secret gun factory in Newport during World War II has gone on display in the city for the first time in 60 years. 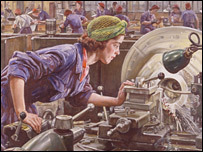 Women at Newport's Number 11 Royal Ordnance Factory were captured performing precision engineering. Created by Dame Laura Knight, the painting became an iconic illustration of the role women played in the war. Show curators said sadly the woman depicted in the painting died shortly before they were able to make contact. The painting's return coincides with the end of a project recording the stories of the 1,200 women who worked there. Called the Gun Factory project, researchers traced some of the Newport ROF workers, who are now in their 80s. But Roger Cooksey, keeper of art at Newport Museum and Art Gallery, said they were unable to track down the local girl Ruby Loftus, who the painting shows working on mechanical equipment. "We almost tracked down Ruby Loftus - the star of the picture - because she was quite famous in her day. But she died a week before we were able to make contact with her which was very sad for us." The painting was voted picture of the year when it was shown at the Royal Academy Summer in 1943. It became an icon of wartime endeavour and has since been displayed at the Imperial War Museum being loaned out to museums around the world. One wartime munitions worker Vera Mayshull remembers Ruby Loftus well. "I was the one that kept taking her cups of tea, " she said. "She was a laugh, she was normal and natural and one of us. "They couldn't have chosen anyone better." The painting will be displayed at Newport's Museum and Art Gallery from Saturday until December. The loan also marks celebrates the completion of a Big Lottery funded project recording the munions factory's history. Oral testimonies of the women who worked there and wartime photographs are recorded in a book and website. "This is what was exciting for us because Royal Ordnance factories were top secret, if you like, during the war so nobody actually recorded their history." Wartime worker Jean Burgess, who was just 19, when she started work at the Newport factory as a turner making anti-tank and aircraft guns. "You walked into this building. It was noisy and grey. One of the things I remember was the greyness. On her first day she remembered being shown how to use her machine and being given a tin of "horrible grease". "I had to put my hand in that grease and slap it on the part of the barrel of the gun that might get hot. "I can remember now my stomach turning - but within a week it was fine."